The cultural shift has changed the way that young people think about food and farming, and today’s college students have grown up with this new mindset. “There’s really just an up swell in the number of students interested in food production,” said Timothy Coolong, associate professor of horticulture in UGA’s College of Agricultural and Environmental Sciences. 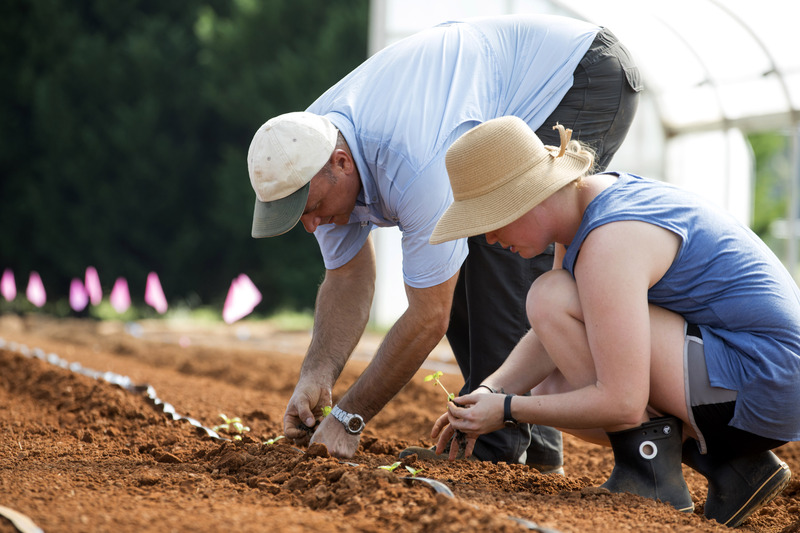 This spring, Coolong is taking over the teaching of organic vegetable production courses in the horticulture department of the agricultural and environmental sciences department. It is a really exciting time for people who are interested in growing food, he said. 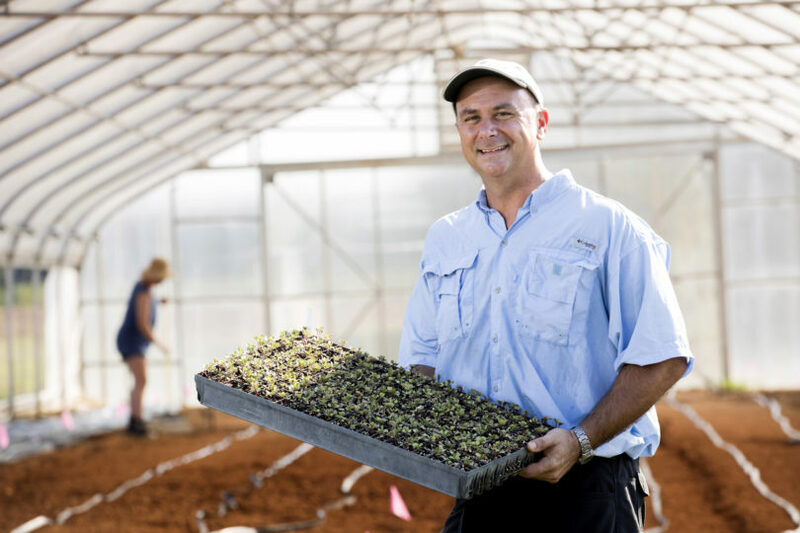 Coolong has a long history in commercial vegetable production and was excited to bring what he has learned over his years working with UGA Cooperative Extension back to the greenhouses where he got his start. Until recently he served as UGA Extension’s vegetable production specialist in south Georgia, based in Tifton. In that role, he helped Georgia’s commercial growers of peppers, greens, beans and tomatoes tackle pests, disease and other production issues on their farms. In his new role, he’ll be teaching graduates and undergraduates the basics of organic vegetable production. 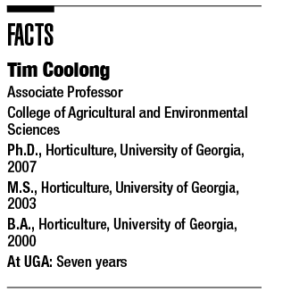 Originally from the Adirondack region of New York, Coolong came to UGA to pursue a degree in horticulture. He ended up earning three: a bachelor’s in 2000, his master’s in 2003 and a doctorate in 2007, with his doctoral research focused on improving the quality of Vidalia onions. After graduation, he took a job as the vegetable Extension specialist with University of Kentucky Cooperative Extension and worked with small- and medium-sized vegetable farmers until 2012 when he returned to Georgia to work with traditional and organic vegetable producers. Although Georgia is known for row crops like peanuts and cotton, Georgia farmers grow a lot of vegetables, and the state is home to several large-scale vegetable farms. There are more than two dozen vegetables grown commercially across the state and those crops were worth about $1.114 billion in 2016. During Coolong’s years as state ­vegetable specialist, his research focused on variety trials and developing irrigation and fertilization recommendations for farmers. In addition to his work across the state, Coolong has worked with several U.S. Agency for International Development projects in Africa and Asia, helping small holder farmers improve their planting techniques and productivity. His experience has given him a broad view of what the future of vegetable horticulture might be like in Georgia, and he’s excited to work with students at UGA to move the industry forward. In addition to courses in organic agriculture and controlled environment production, he’s planning to do more research and develop more courses focusing on growing vegetables in plant factories and hydroponics greenhouses.